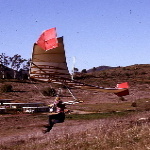 US Hawks Hang Gliding Association • View topic - Dockweiler looks GOOD Monday, July 2nd!! Anyone up for a fun day at Dockweiler? Re: Dockweiler looks GOOD Monday, July 2nd!! I can't make it Monday and on Tuesday I'll be at High Energy Sports, making the final (hopefully) changes in my swing seat harness. It was a good. day.